Local militias, organised around city quarters and surrounding towns, play an important role in Italian armies. Whilst service is compulsory, it tends to be short and most serving it are sustained by a strong element of civic pride. 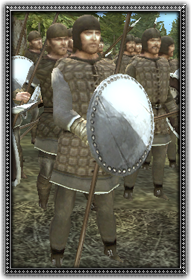 These spear militia are comprised of more experienced troops with some armour and long spears, making them a tough defensive unit.